As the UK Labour Party rips itself to pieces and as the Conservative Party, through great statesmanship, pull back from the brink and start to take on its heady responsibility of a “Compassionate Brexit”, I thought a reminder of the power of coming together would be handy. Individually we are limited. If we are “stuck in our own story” we can never create a “collective story”. It is only when we come together that we truly shine; we become “collectively brilliant”, and now is the time for collective brilliance amongst our political leaders! So, I have a beautiful and quirky demonstration of “Collective Brilliance” to share with you. Whilst delivering a top team leadership and team development session in Dublin for a client that I have been working with for many years now, a lively conversation ensued following a communication between one of the delegates, a friend and colleague, Eli, and his wife, Kate, back in the USA. 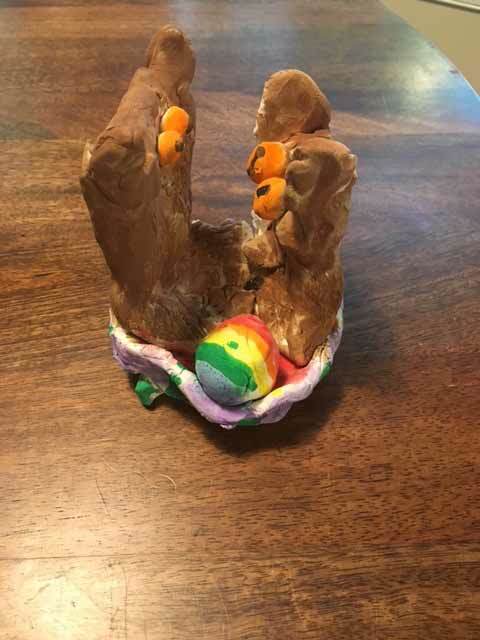 Eli had been sent a picture of a clay model that his young daughter had made at school, with the innocent question from Kate of “Any ideas what this might be”? (filed under the category of “WTH”, apparently)! Showing the picture to all assembled, a diverse and complimentary team of some 20 people, a great debate started on its form and meaning, and demonstrated just how different we all are. The general consensus was that it was cute – beauty is in the eye of the beholder! At times the discussion was heated and full of emotion. Some withdrew and studied the image intensely before sharing their considered thoughts. A few threw out a constant stream of half-baked ideas on what was before them, and others, huddled round the screen in small groups in ernest discussion. Some unsure, others with great conviction; the ideas kept flowing. Rich, varied, crazy and fun; the thick soup of creativity was bubbling nicely on the stove. Suggestions were made without fear of meaningful judgement. Fun and banter yes, but no one held back believing others would negatively judge them. The “culture” was one that allowed all to share and engage. and once the answer was revealed, the “owner” of the “right way” was genuinely congratulated and supported by all, with only some good humoured mumblings of dissent! A great example of open thinking when judgment is suspended, and a little alcohol is involved!